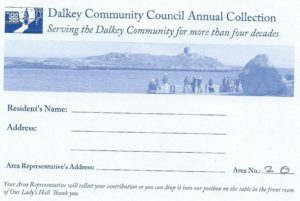 The April edition of the DCC Newsletter includes an envelope for our Annual Collection. We would appreciate if you could put your contribution into it and return it to your road representative or simply put it into the Community Council’s post-box on the table in the front room of Our Lady’s Hall. The Community Council relies on all contributions to carry out the many activities we engage in such as making representations to the County Council on all matters involving Dalkey, the lighting of the Christmas tree, planning matters, sponsorship of local groups e.g. Community Games, Annual Garden Competition, Garden Outing, Annual Art Exhibition, local projects etc.